Prelude Music Classes for Children - Prelude's Blog - What (Besides Music) Is My Child Learning in Class? What (Besides Music) Is My Child Learning in Class? We apologize that this month's blog post was delayed due to Ana's busy travel schedule. She actually wrote it on a plane 37,000 feet in the air! Week after week, you show up at Prelude Music Classes to sing and dance with your children. We love to teach Music Together® for many reasons, but mostly for the sake of music alone. Music makes us feel good, it helps us to connect and play with our children, and it helps us soothe our little ones in times of fear and stress. Let's take a moment to look at what your children are learning — besides music, of course! I want to share with you the many concepts your child is exposed to in class and may be learning simply by watching you sing and dance, both in class and at home. We move to the beat. We shift weight from one leg to another (locomotor movement). We model small and large movements. We experience directional movement when we go around the circle to the right, then turn around and move to the left. We work on balance and body awareness. Children learn to "follow the leader" without us using any words! We do this by modeling actions instead of giving instructions. Children also develop coordination of their eyes, ears, bodies, and voices as they mimic us. Many of the songs in our musically rich program are in non-major keys or tonalities. We expose children to tonalities from all over the world, giving their ears a chance to develop recognition of a wide variety of sounds and scales. 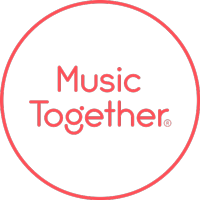 We build a musical community by singing together, which helps us bond not only with our children, but also with others in class. Many of our families have met wonderful friends in this program. By singing together, we are teaching what it means to be an ensemble. By taking turns, we learn cooperation. By accepting ideas directly from the children, we help build their self-esteem. Every child is included and accepted in every class. Another social concept that can't be left out is empathy. Often when a child cries in class, we notice several children (sometimes non-verbal children) try to comfort the crying child. When we did Maracas three years ago, I observed a class that Jonathan was teaching. He was leading "Jack be Nimble," and every time the "stubbed his toe, awww" part came, a child came to kiss his aching part! It was so moving to see this child genuinely wanting to make sure her teacher was okay, and she really wanted him to know she cared. And think about the love your child feels when you sing him or her a lullaby, especially when you sing the words "I love you" like we do in "Su La Li." There is so much more going on in class than we may even realize at any given moment. I encourage you to become a master observer of how your child learns. Notice how he receives music. How does she like to play with music? What are some of the things you notice when music is playing — or better yet, when you are singing to your child? Our music class is a wonderful, developmentally appropriate environment where every child has an opportunity to develop his or her music potential by playing with music. Remember, children must learn to play with music before they can make music. Thank you for being a part of our music-making community! Spring has sprung at Prelude, and we're abuzz with activity! Visit the Prelude Events page for information on upcoming family concerts, our Prelude Singers Concert, the Woodlands Woodway Arts Festival, parent education classes, and much more!